It's almost Christmas, the blue lights of the tree light up the room, a cinnamon tea smokes on the table. I turn on the stereo, press play .. "Sweet and Sour Please!" .. and suddenly the reassuring heat of a July afternoon stands out in my mind. The siblings Goran and Gaia, Galeb & The Seagull, were sitting on the same sofa where I am now. The next day they recorded this album, in a few hours, just like the good old times. Two voices, a guitar, a harp and a handful of good tunes; what is needed, nothing more. All enriched with authentic lyrics of a disarming sincerity; precious diamonds accumulated around the world. Fleeting glances, friends, endless landscapes, love, farewells, returns, wine, sweat, hope and much, much more. Expressions of a life lived to the fullest, between long journeys in New Zealand, Australia, Lyon, the hills of Barolo, the familiar Trieste and the new home: Berlin. Berlin.. an indefinable city, pulsating, multi-ethnic, energetic, constantly changing and waterproof for many.. Berlin.. Its streets, its people.. This is the new lifeblood.. Here Goran makes his living now, with his tunes, playing in clubs and doing the busker, the picturesque street musician. 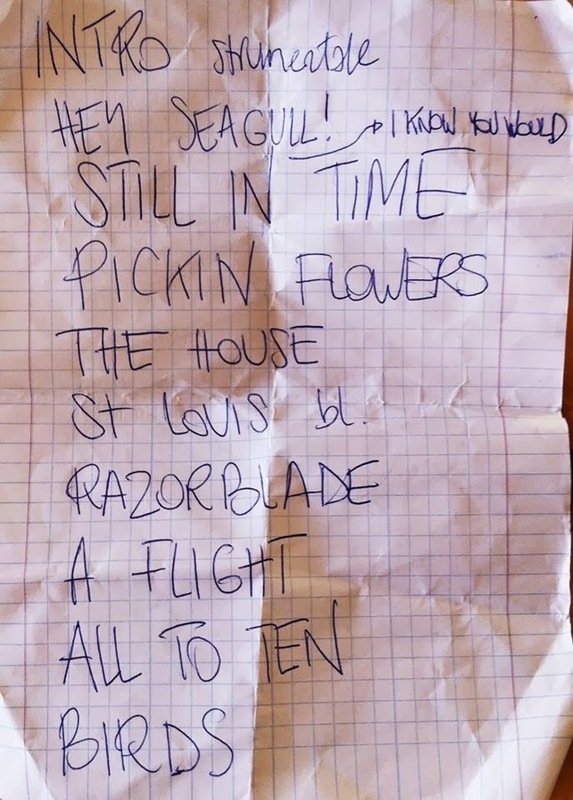 It is precisely in Berlin that Goran recorded "Picking Flowers", a flight that does not disappoint even without the Seagull/Gaia (back to Trieste due to university commitments). Perhaps the missing of his sister makes him lose a bit of the beautiful vocal dynamics of the previous album but the result, however, does not disappoint, in fact confirms a genuine talent, at the height of the masters. Leafing through my album of music memorabilia I read with pleasure a dedication that Goran wrote to me before one of his numerous departures: "Dedicated to the one who can sip the sap of the dream, to keep it alive." This is precisely what the lucky presents have been able to enjoy at Tetris: the sap of the dream, kept alive.. It's ten and a half, Goran is alone on stage, wearing the ubiquitous brown vest over a striped shirt, bare fingers glove on his right hand, like an authentic busker. Tetris is still half empty, but it will not take long to fill up. The instrumental intro from his new album “Picking Flowers” starts the show on his red guitar (the cheapest in the world, to paraphrase his own words). He is sitting as a seagull perched, ready to take flight, the lucky audience timidly begin to approach. "Still in time" .. an arpeggio emerged from long years of classical studies .. "The 120 arpeggios by Giuliani" style .. results in a gritty chord progression supported by the harp and an almost impatient vocal “And forget the reason why.. Your not sleeping quiet at night.. It's alright, your still in time!” .. The guitar begins to croak, something is going wrong, Galeb seems a bit unstable, I see it in his eyes .. But here, with a masterstroke, enters Seagull .. The sister Gaia, with a confidence of a mature performer, keeping time on a tambourine .. She takes the stage with great ease and the flight finally takes off.. the mad flight of Galeb & The Seagull. "For the one who love to turn the mistake into a work of art"
Another dedication Goran wrote on my copy of "Sweet and Sour, Please!" shortly before his first departure to Berlin. What we are witnessing, ladies and gentlemen, is getting closer and closer to a work of art ! "Pickin' Flowers”, the title track of the new album, literally sent me to another planet, no doubt about it. The tune is perfect, nothing is missing , everything is exactly where it should be, a marked improvement from the last time I saw them playing on a stage, and us, lucky viewers, follow the trail. "The House on the top of the hill" and the bucolic harmonies are now smoother and calibrated at best, a pleasure for the ears. There is also space for Goran's great passion: The Blues. It's the traditional "St. Louis Blues" practiced for the first time that same morning (!) hopefully it will find space in the next record. We then move on to "Razorblade" a pleasant song, raggie style. Once again Gaia's voice rises the dynamics further. "A Flight is a song dedicated to all of the people who still manage to fly into space and watch this crazy world through the eyes and mind of a child, finding beauty where everything looks gray ." We are slowly coming to an end, the perfect timing for my absolute favorite, the little masterpiece called "All To Ten", listen to it, then listen again, and again.. I'm sure it will not disappoint you! The set ends on the song "Birds" Goran's harp makes us glide in distant lands, the world is so beautiful and reassuring from here. The words that present the encore say it all: "Since we have been reassuring and sentimental throughout the whole evening, now we will be critical" and "What about the fish" begins; a small warning about "All the things we forget in the hectic modern life "
This leg of their mad flight stops here, the goal is to live on it for another six months , but if they continue like this , they will surely arrive well beyond the Pillars of Hercules. Encore: What about the fish?